An echo sounder is typically mounted or towed by a boat, and is used to measure the seafloor by sending pinging noises to the seabed and listening for the echoes. An inverted echo sounder (IES) uses the same technique, however it is reversed. Animation of an inverted echo sounder. 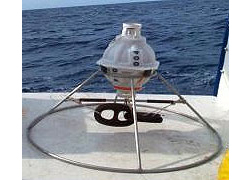 An IES is mounted on the seafloor and sends pings to the ocean surface. It then listens for the return echoes off the surface water and records the round trip travel time. A bottom pressure recorder is also mounted on the IES and records variations in the sea level. Using the time for the sound to travel to the surface and back, corrected for sea level variations, the temperature of the water column can be determined.